From the problem that I always have the mascarpone cheese in the fridge but I can't use it all, haha. But what can I do? The book is cute and there are a lot of the variations. (If you read my blog you will remember that I really love this woman, Takako Inada, I have almost all of her books). Most of the recipe doesn't use butter (last year it's very hard to find the butter in Japan, my friends complained about it every time that I talked to them). So the base are cheese, sour cream, oil or yogurt, it might great for the time that we can't find the butter ! 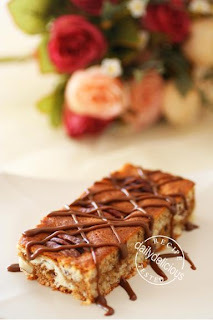 This cake is very easy (again ^_^), the mixture of the cheese and the coffee is a good combination. The original recipe use a lot of coffee, but I think it a bit bitter, so I reduce it. But if you like the bitter taste you double the amount of the coffee (both in the cake and the icing). 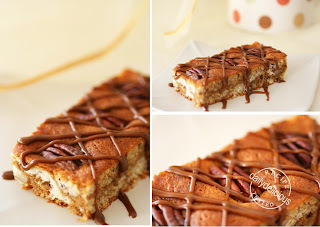 So, anyone who enjoy coffee flavor will love this cake too. Preheat the oven to 170°C. Line the 15x15 cm square pan with baking paper. Mix the instant coffee with the liqueur. Melt the mascarpone cheese in the microwave (about 20-30 seconds), let cool completely . Sift the flour, almond powder, salt and baking powder together. Beat the egg with the sugar. When the egg is light and puffy, pour the mascarpone cheese into the mixture. 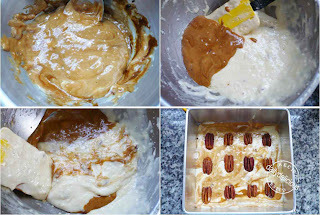 Put the flour mixture and pecan nut into the egg mixture, fold to combine. Pour the oil into the mixture, fold to combine. 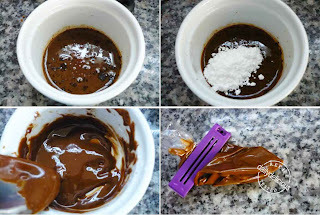 Take half of the batter and mix into the coffee mixture. 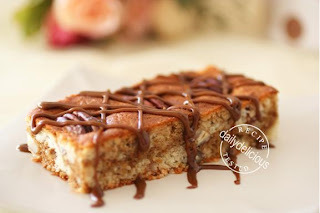 Pour the coffee mixture into the batter bowl and fold only 1-2 time to create the marbled affect. 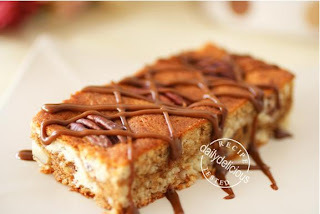 Pour the mixture into the pan and place the pecan nut on top of the cake. Mix all the ingredients together, put in the bag. 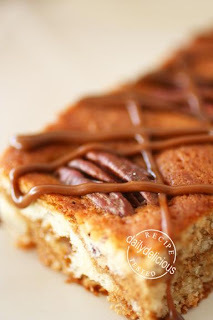 Use the icing to drizzle over the cake. Do you know why it was difficult to get butter in Japan then? That's really strange. My friend told me that after the situation the butter's price increased. So, it might be the main reason - to make the price increase.